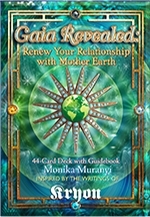 Within this beautiful and well designed card deck are 44 cards intended to further enhance the connection and communication between the Human Being and Gaia. Within the accompanying guidebook is a system where every card has a corresponding message from Kryon, as given by Lee Carroll. Begin each morning or end each day by choosing a card and giving thanks to Gaia. This absolutely makes a difference in your life, and will amplify Gaia’s love and support for humanity.